Scholarly activity is obtained in a variety of ways – from a QI Matrix to original research and everything in between. Residents are encouraged to submit their work for publication and/or presentation at local, regional and national meetings. The two interns from both the orange and green housestaff teams complete a QI matrix that assists with defining an identified problem and determining how the safety issue impacts care. This is presented at teaching conference and opens up a discussion about possible solutions. Some of these identified issues are used in the Systems of Medicine course where further development into a QI project occurs. Each resident prepares a QI project annually using his/her clinical patient data which is then presented and discussed in the ambulatory teaching conference. Additional Scholarship is showcased in local, regional and national events. This Symposium highlights the work of all of the Spokane residents. Abstracts are submitted and 9-12 selected for oral presentation. Posters are also prepared for this meeting. Both the oral and poster winners in this judged competition are awarded cash prizes. The Spokane County Medical Society hosts an annual CME event where at least one IMRS resident presents an abstract. The Spokane Society of Internal Medicine is part of a larger Primary Care Update that occurs in Spokane each May. Residents can participate as selected oral presenters. The Washington chapter of ACP (American College of Physicians) sponsors a competition for residents of the four Internal Medicine training programs in the state. Each IMRS senior resident prepares an abstract about an interesting case or a research project. The abstracts are judged and several are chosen for oral presentation at the Regional ACP meeting. The presentation winner gets an all-expense paid trip trip to National ACP for presentation. Spokane was the winner of the 2016 competition! In addition, residents can submit posters of their work. The state chapter also hosts a Spring Scientific meeting for presentation of QI/research/works-in-progress. Society of General Internal Medicine has both a regional and national meeting for residents where oral and poster presentations are given. Generally, Spokane has several residents who participate. Two residents last year presented abstracts/posters at national meetings – one GI meeting and the other Pulmonary/Critical Care. Residents at all levels have the opportunity to collaborate with faculty on projects. Several projects are completely clinical – examples include revision of DKA protocols in the ICU, Sepsis project utilizing ProCalcitonin and Hypothermia research. 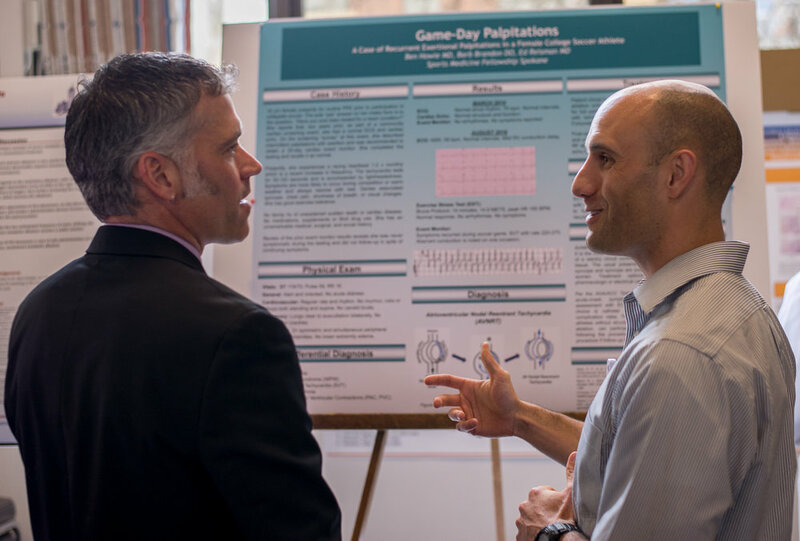 Other projects proceed along a more traditional research pathway; this year two residents have gone to National meetings to present both posters and orally (GI and Pulm). Residents are encouraged to advocate politically for their profession and for their patients. A resident is a member of the Spokane County Medical Society board and opportunities exist for board participation in the Washington State Medical Association. In addition, IMRS residents annually participate in the ACP Leadership Day in Washington, D.C.